I see a lot of different tongue problems or tongue diseases as a dentist in general practice. Some are relatively uncommon, but others are almost a daily occurence. Some tongue conditions can be very important, even life-threatening. When you have a problem with your tongue, you suddenly realize how much we all tend to ignore our tongues from day to day. If you've noticed something different about your tongue, it can be very difficult to forget about it! But sometimes we try to ignore a small ulcer or a tender spot where a denture is rubbing a bit. You should ALWAYS get it checked if you notice something different about your tongue, under your tongue, or for that matter anywhere in your mouth. What TONGUE PROBLEMS are there? There are quite a few, some of them with rather odd-sounding names, but all of them can be annoying, and one or two can be very important. Here's a run-down of the more common disorders; just click on the blue title to read more! Tongue ulcers. Sometimes you can get a small ulcer on your tongue, so small it's barely visible. However it can be very tender, especially if it's on the very tip. You just can't avoid your tongue touching your front teeth and rubbing on any little uneven surfaces! I get these from time to time, and I know from personal experience how annoying it can be. Usually, it settles down within 2 to 3 days. If it takes any longer than a week, get your dentist to check it. Sore tongue from trauma, either from a sharp edge on a tooth or denture, or tongue injury from biting. This is surprisingly common, but we need to be sure that it heals up inside a week. Tongue infections. There are some infections that can affect the tongue, usually a fungal infection. These top 3 tongue problems can be helped along until they heal up by using a top-quality mouthwash, such as TheraBreath. I really like TheraBreath products! They release oxygen, and help to prevent infection getting into the tongue ulcer or injury. Have a look at the TheraBreath Oral Rinse on Amazon. Tongue herpes is a painful condition also known as "cold sores". It is quite different to canker sores, and is highly infectious. It's important for you to know the difference between cold sores and canker sores - find out what you need to know by clicking on the Tongue Herpes link above! Coating on tongue problems. These are usually white or grey in color, and can affect the whole of the top of the tongue, or just in patches. 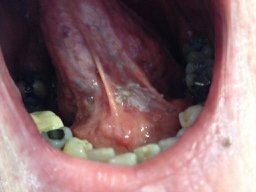 Leukoplakia. This is a white patch on your tongue or inside your cheek. While a leukoplakia itself is harmless, it may lead to more serious conditions. Treatment of leukoplakia is very simple, so it's best to get any white patch checked as soon as you see it! Geographic tongue. This can look quite bizarre, and causes a lot of worry the first time it's noticed, but it is entirely harmless. Burning tongue syndrome. If you feel that your tongue has a burning sensation, you may have "burning tongue syndrome". White patches on tongue can look alarming; the white area can cover your entire tongue, or just a part of it (usually on the side). Black hairy tongue. This really IS the correct medical term for this condition! This is a harmless condition, but can look quite alarming at first. Tongue swelling. Your tongue can swell up for a number of reasons. It's usually just more annoying than anything else, but there's one time when it could be lethal. Numb tongue. You may get a numb tongue after implant surgery or wisdom tooth removal. There are a couple of other causes, too. Find out here! Cancer of the tongue. This one you want to catch as early as possible. The sooner you get it diagnosed and treated, the better. Most tongue cancers occur on the side of the tongue, but they can crop up almost anywhere around the tongue, as in the photo above, where it is UNDER the tongue. There are several more photographs of different types and positions of tongue cancer at tongue cancer pictures. If you are worried about the possibility of mouth cancer, you can read more about the symptoms at Mouth Cancer Symptoms. But be warned - there are some shocking photos of mouth cancer that was ignored for several years, allowing it to grow to a horrific size. As you can see, there are quite a few conditions that can affect the tongue. Most are harmless but annoying. The real importance of tongue problems or tongue diseases is that you want to make sure it's not anything more serious. Which it isn't in 99% of cases! So, to minimise the risks of your tongue problems turning into something nasty, ALWAYS get that bump, white patch or ulcer checked as soon as possible. Definitely within 10 days of first noticing it, if it hasn't settled. Sooner is better!